Like many of us with backyard flocks, I’ve been anxiously tracking the forecast. In Texas we don’t get much snow, but our temperatures can drop low! I had been hearing all week that the snow and ice would miss us, so I wasn’t expecting much outside of freezing temperatures. Little did I know there would soon be snow for my Texas flock! 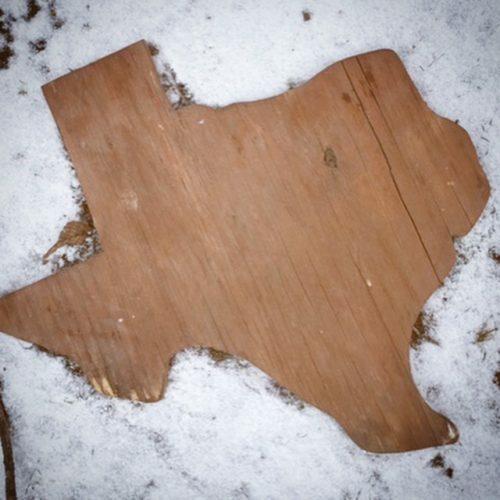 Snow in Texas? What should I do to prepare my Texas flock. 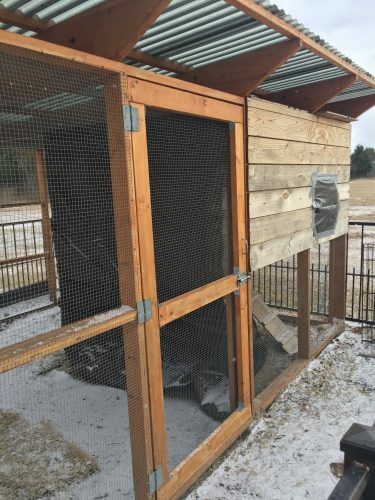 For that reason—and in true procrastinator form—I waited until the day before the cold front hit to winterize my coop and prepare my Texas flock. In my over-sized jacket, I grabbed a tarp, zip ties, and duct tape. My coop wasn’t going to pretty, but it was going to be warm! When cold weather comes, I usually surround the exterior of my run with tarps so that wind can’t whip through the hardware mesh. Since right now I have young juveniles who stay in the coop, I decided to wrap up the coop portion instead. I built the coop myself, and while I’m proud of my ingenuity, I didn’t do a great job with making it draft free. There are significant gaps between the planks on the walls that needed to be covered. My egg door was going to be a problem due to the large gaps between the planks of wood, so I folded a large trash sack and duct taped it over the door (I told you it wasn’t going to be pretty). With numb fingers, I headed back inside. I woke up in the morning to the freezing temperatures I expected, and ran out to the coop to check on my birds. They were all safe inside the coop! The waterer had iced over so cleaned it out and refilled it. Every year I debate buying a warmer for the waterers, but the temperatures always rise before I make the purchase. Thanks to my indecision, I got to pick ice out of the waterer with my fingers, brrr! I can say that next year I’ll be more responsible, but the odds are not in my favor! As the day progressed snow started to lightly coat the ground. Snow on my Texas flock! Every hour or so I would venture out to check on my flock and their waterers. My tarp held up, so no wind or snow made it into the coop! I moved my computer by the window and enjoyed watching the snow fall while I answered my emails. 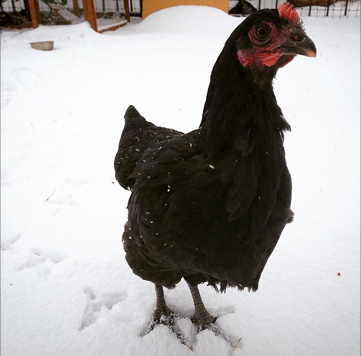 It was too cold for my Chick Pack juveniles to play in the snow, but my older girls loved it! I don’t force them outside when it’s cold, but I leave the door open and let them venture out if they feel up to it. To those of you who live with constant freezing temperatures, my hat is off to you! May you and your flocks stay warm this season. Thanks to the crazy Texas weather, we will be back to 70 degree weather in a week. I know I am late to the game on response, but an idea for sealing up drafts is to repurpose the bags that your feed comes in. Those 50lb bags are great for use in place of trash bags and much more sturdy.